Bhopal Development Authority invites applications for the allotment of various houses under BDA Swami Vivekanand Housing Scheme 2016 at Katara Hills. The scheme is located at Swami Vivekanand Housing complex, Katara Hills. Under the scheme, the authority has offering houses to Economical Weaker Section and Medium Income Group of the society. 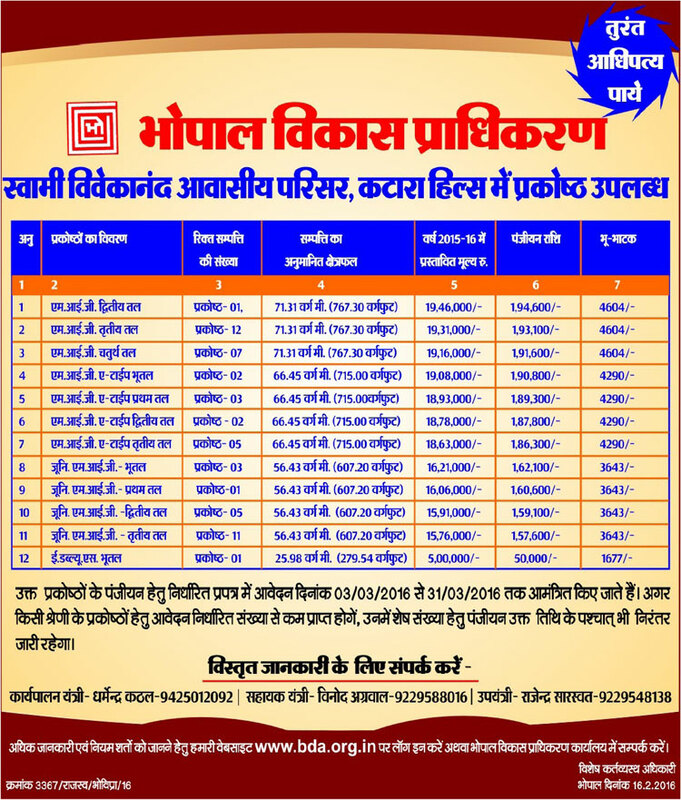 Applications for the allotment of houses under BDA Swami Vivekanand Housing Scheme 2016 are being offered through online mode of registration from 3 March 2016 and the last date of applications submission for the scheme is 31 March 2016. Interested applicants can apply for the scheme till the last date of applications submission. How to Apply: Registration for the scheme has been started from yesterday and interested applicants can apply for the scheme by using the official website of Bhopal Development Authority or by using the Apply Online link below. For further details visit the official website of BDA Bhopal.